Whilst New York is suffering from death and destruction caused by mega storm Hurricane Sandy, which has killed tens of people, retailer Gap has been encouraging Americans to stay safe inside and shop online. A PR nightmare. At the first hint of trouble, Obama cancelled his campaign trail dates and diverted to Washington to deal with the crisis (something which may stand him in good stead in a week’s time.) So, why was Gap making light of the situation? They’ve since learnt the error of their ways and deleted it. But, what on earth convinced them that this was a PR opportunity in the first place? In a national ‘mother nature’ crisis, brands are judged on their actions. And, the best action is charity – brands putting their money where their mouth is. For a few minutes it looked as though American Apparel was going to do the right thing by organising a clothes sale to raise funds for victims. 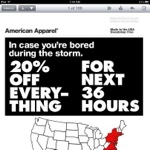 Instead it cocked this opportunity too with its strapline with ‘Incase you’re bored of the storm – 20% off everything’. This, naturally, led to another Twitter revolt. There’s simply no humanity or empathy with these companies. These examples are laughable to you and I, but the scary thought is that someone’s being paid to lead these social media strategies. How they deal with this PR storm will, hopefully, test their sense. This is just completely shameless! I can’t believe someone is being paid for this! 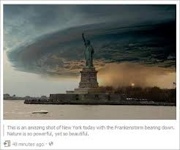 Most of the people in New York son;t even have any power to use the internet! Ed – This is very true. A topical campaign launched on a digital platform during a hurricane is ludicrous. It’s lose – lose.